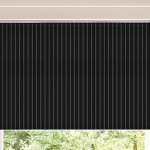 Humberside Sunblinds are suppliers and installers of an attractive range of pleated blinds – a flexible design that’s ideal for any unusually-shaped window or room. All pleated blinds are available with our perfect-fit system, offering a greater control over room temperature by blocking the sun’s rays in the summer and retaining heat in the winter, and are well-suited to conservatories and roof windows. Our Immingham showroom, the largest of its kind in the region, is perfectly placed to serve the whole of Cleethorpes, Grimsby and the wider Lincolnshire and Humberside region, and stocks our complete range of pleated blinds. Our helpful and friendly staff are available for free home visits to assess your needs, measuring your windows and conservatories before offering you a free quote. All of our made-to-measure blinds come with free fitting, and are manufactured directly by us to ensure an attractively cheap rate on every purchase.